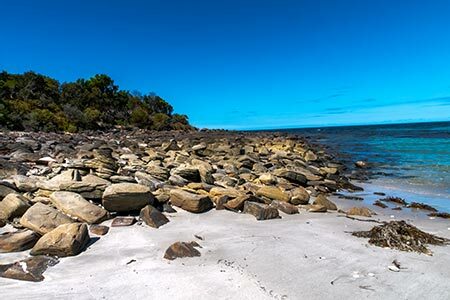 Secluded inlets, wild rocky outcrops and a lagoon are just some of the features you will encounter on this short trek along the white-sandy beaches of Little Musselroe, Tasmania. 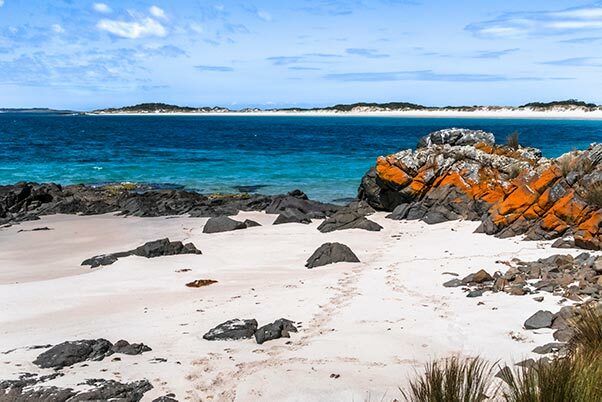 Where is Little Musselroe Bay, North East Tasmania? 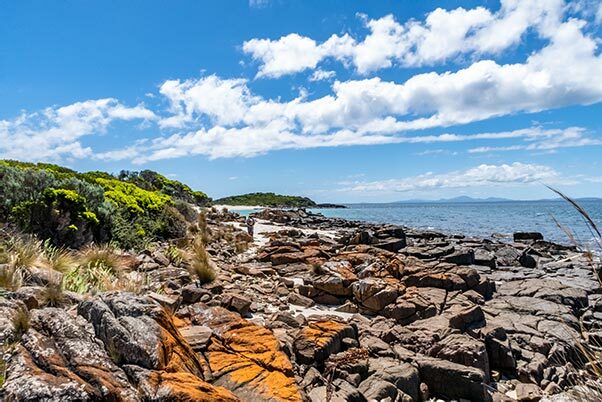 It takes about one hour from Tin Dragon Cottages to drive to Little Musselroe in Tasmania. There is sealed road to Gladstone, then a well-maintained gravel road to Little Musselroe. It is an easy drive that is suitable for all makes of cars. When you leave your cottage drive along the A3 towards Derby. After Derby you continue on the A3 then turn left onto Gladstone Road (B82). Now keep driving till you reach Gladstone. Of course you may be tempted to stop for a quick look at Little Blue Lake on the way! In Gladstone you turn right past the General Store, then just through Gladstone, turn slightly left onto Cape Portland Road(C844). 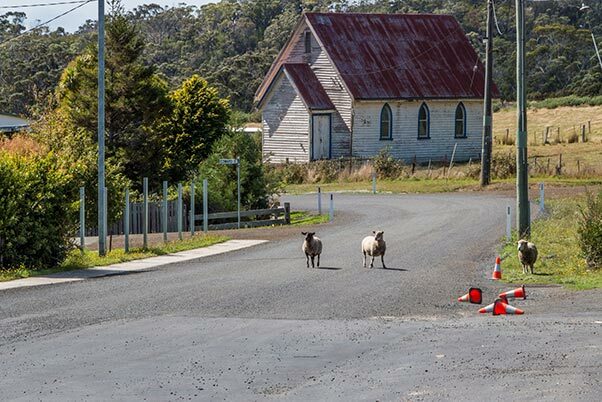 Ahead of the anticipated increase in tourist visitation, Gladstone is trialing a new strategy to slow down the traffic. 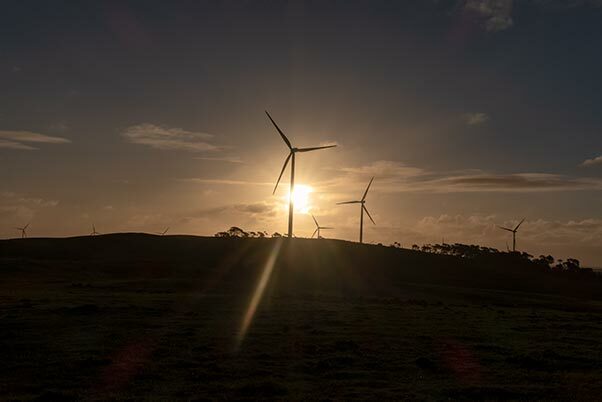 Remember to look out for these workers on your next trip to Mt William National Park or Musselroe Wind Farm. Continuing on the C844 you will drive through the (very) small hamlet of Rushy Lagoon. Next you will come to the entrance to Cape Portland Rd – don’t continue straight ahead – take a sharp right-hand-turn. This is Little Musselroe Road. There will be a few more twists and a sharp turn to the left. Again don’t drive into the Road entrance to Cape Portland–I think it is a locked gate. If you are observant you should see the gate to the Tebrakunna Visitor Centre on your right. 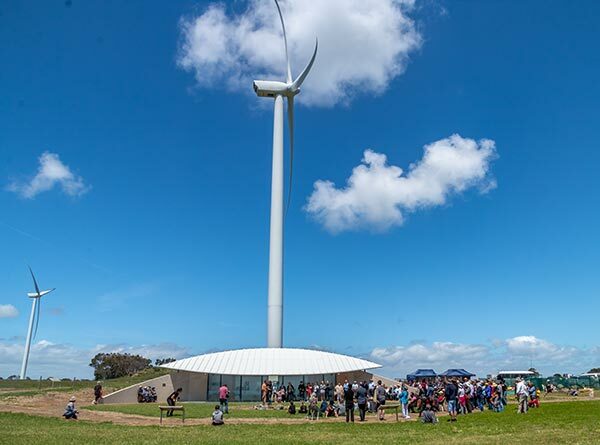 The visitor centre is open March to October (inclusive). So, if it is open, I recommend you take a detour. As well as an informative display and grand views out to the Bass Straight islands, toilets are available here. You are close now! Keep driving on Little Musselroe Rd till you see the beach at the end of the road. Don’t turn off to the right down any of the other tracks, or off to the left to Petal Point. 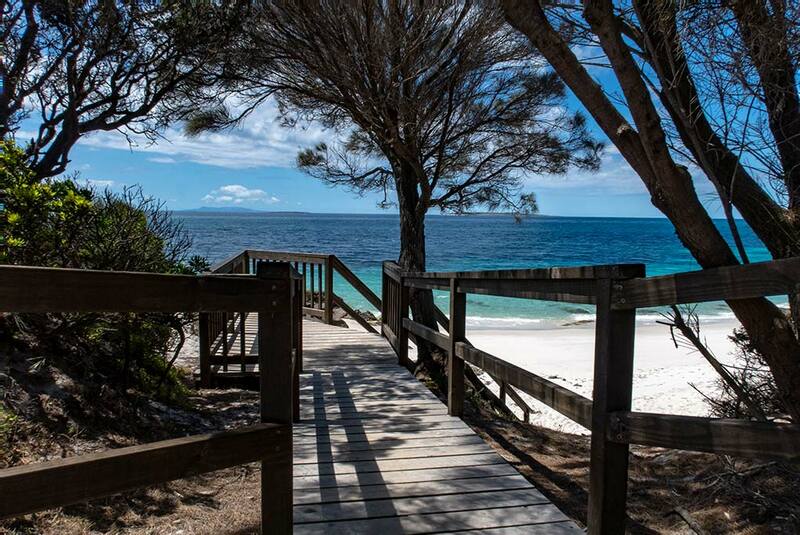 After walking down the steps under the shade of the she-oaks you will be confronted with dazzling white sand and sparkling blue ocean. It’s time for you to go exploring! This short walk will take you about 45 minutes (one-way). With your sunglasses firmly secured, walk left toward the rocky point. Then find your way across the rocks to the next inlet. I wouldn’t recommend walking over the next rocky outcrop. So you should be looking for walking tracks through the low scrub behind the beach. When we were there last year (November) there were several tracks. I guess some of these are animal trails. However if you head inland you will see a lagoon. I imagine the lagoon would be wet in the winter months, but it was dry in November. Graham crossing the dry lagoon, wind turbines in the background. 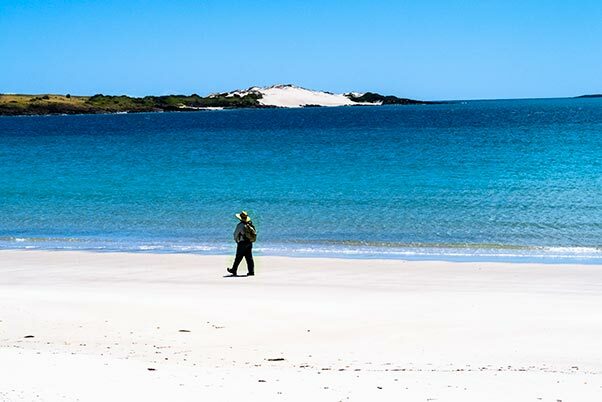 After walking over the sand dune at the far end of the lagoon you will come out onto another beach. 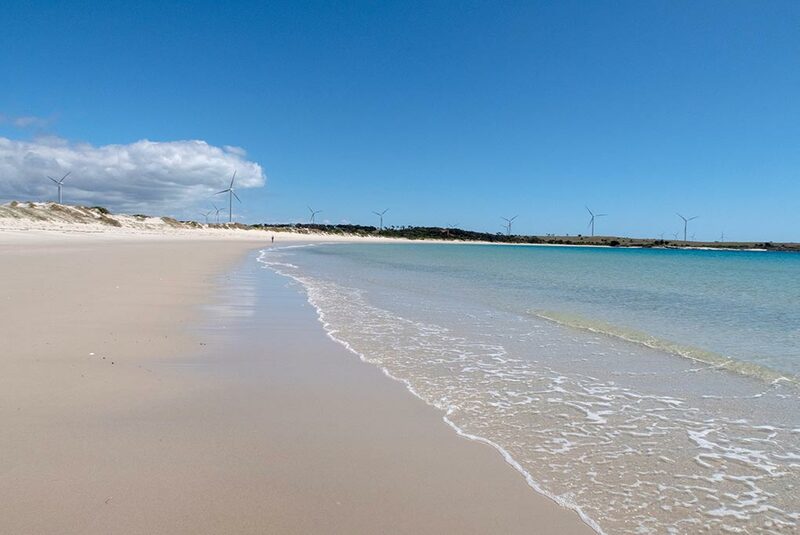 This sweeping beach is stunning! I think it is unlikely that you would need to share the scene with other people, because the beach was deserted when we were there in November. 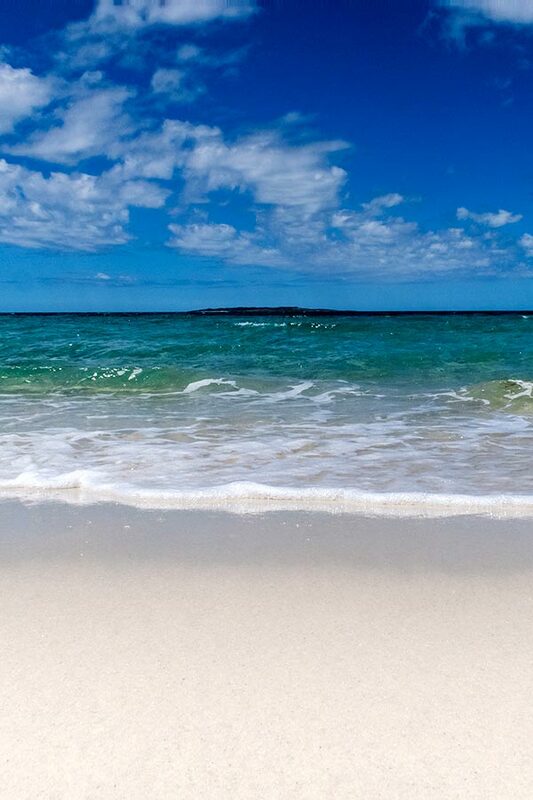 Just soak in the vastness of the white sand and the clear waters of the Bass Straight. We didn’t go swimming, although the water looked calm and inviting. Remember that this location is isolated if you get into trouble. So please be cautious if you choose to have a swim here. 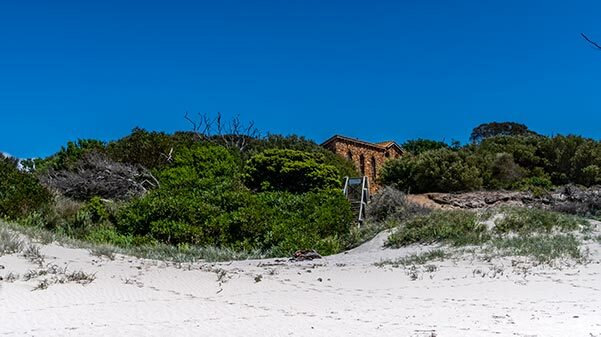 Your attention will be drawn to a stone building behind the dunes at the far end of this beach. As you get closer you will see signs with strong warnings about surveillance cameras! We don’t know who owns this intriguing house. 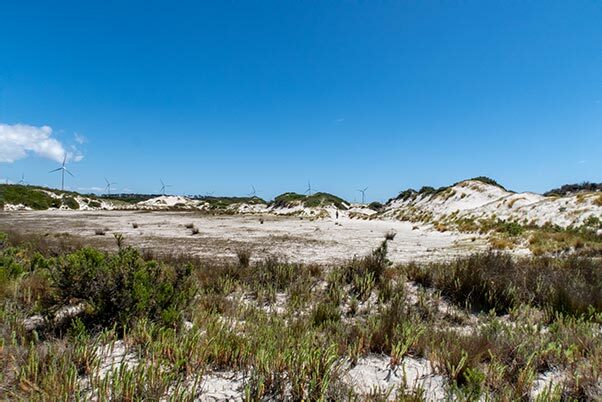 But we believe it may now be owned by the Musselroe Wind Farm. Just off the low sand dunes we found some burrows. Perhaps these are penguin burrows? Walk to the next rocky outcrop. You will see some remnant fencing and a track. In front of you is a small but impossibly beautiful bay. This beach is so intimate, it felt like my own secret beach. Here you can sit on the rocks and just day dream out to islands in front of you! Swan Island is the closest, then Clark Island. 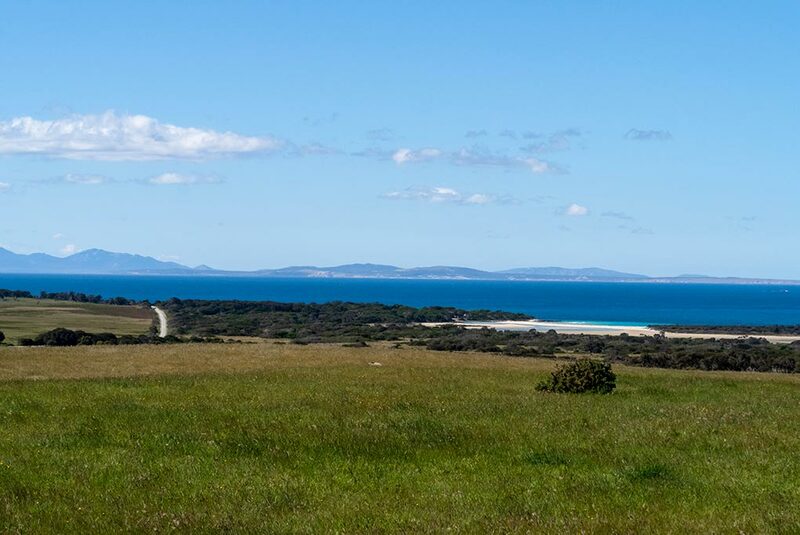 The mountains on Cape Barron are visible on clear days, too! 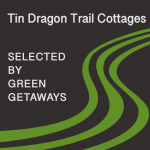 After exploring the shoreline around Little Musselroe, it’s time to retrace your steps and return home to Tin Dragon Cottages in Branxholm.